How to hide a Tab in the first level/second level of portal Top Level Navigation. How to arrange the tab positions in first level/Second level of portal Top Level Navigation. How to hide a Role/Workset/Page/Iview in the Top Level Navigation. How to hide Link of Workset/Page/Iview in Detailed navigation of Portal. First let us see the structure of Classic Framework Page of Portal. In the above picture you can find the Top-Level Navigation Iview. It has Roles as First level and Worksets/Pages/Iviews as Second level of navigation. In the above screen shot ESS/Service Desk/MSS/Content Admin/User admin/System Admin are Roles. And Portal content Management / Portal content Translation / Portal display / Web resource repository/ KM content......... are the Worksets/ Page / Iviews of Role Content Admin. Now in this post lets discuss about the Arrangement and Visibility of these Roles/Workset/Pages/Iviews in the Top Level Navigation/ Detailed Navigation. Now lets us Create a Role in Portal. For how to create a Role in Portal click here. For different types of Roles click here. For Portal Object Assignment click here. Now Open the Role created. by right clicking on the role and select open > object. Then the editing wizard for that role will be opened on the right side of screen. Now add some Workset, pages, IView to this role. If you want to add any object to role. Just open the role in editor like above and right click on the object and you will find option . 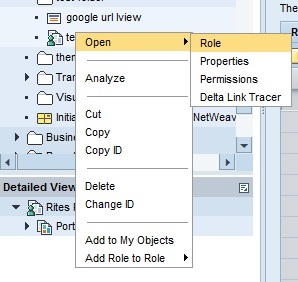 add iview to role/add page to role/add workset to role. If the entry point of the role is not enabled then the role will not be visible to User. after adding some objects (pages, workset, Iview) to role. Now lets see how it looks in Portal. after assigning this role to some user. you can see the test role in the first row of Top level navigation. and the iviews, pages, worksets added to it in the second level of top level navigation. now if you want to arrange the tabs in second level of top level navigation. when you select any iview/workset/page the option move up and move down will get enabled. you can in this way arrange these by moving up/down. let me change some and see in the portal. This is one way you can change the second level arrangement. Other way is you can set sort priority property. Sort priority can be changed by by going in to the properties of Iview/page/workset. Sort priority was marked in the above (3rd from here) screen shot. Now coming to First level of Top Level Navigation. you use the same Sort priority property to change the arrangement of First level of Tope Level Navigation. you can observe the property visibility in the above screen shots. just by checking/ un checking you enable /disable the visibility of the object.